Tripadvisor will alles von mir wissen. Und haben. Alles. 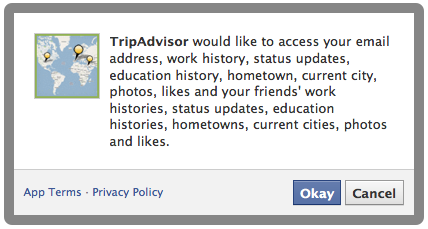 TripAdvisor would like to access your email address, work history, status updates, education history, hometown, current city, photos, likes and your friends’ work histories, status updates, education histories, hometowns, current cities, photos and likes. Und da gibt es Leute, die da auf “Okay” klicken? Die von der Spackeria? Das Hochwasser, gesehen aus dem Zug nach Prag.